New York City, NYC, is by no doubt, one of the most exciting cities in the world. There are tons of things to see, tons or activities to do. We can't seem to cover all the "must do" and "must visit" places in a week. Infact, we barely manage to cover it in 10 days. What's visiting the Big Apple without seeing this iconic statue? There are a number of ways to go on the ferry to see the statue. 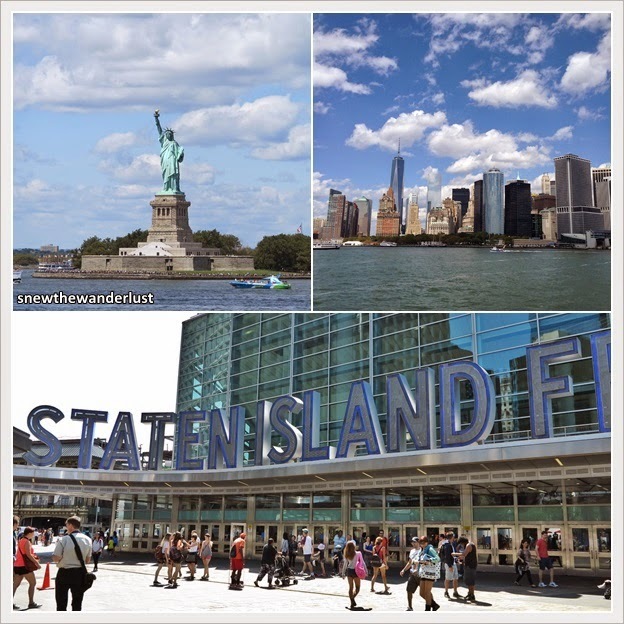 If you are on a budget, you may want to get on the free Staten Island Ferry. The ferry is a mode of transportation for those staying in Staten Island, to get to Manhattan. The ferry operates every half hour on off peak and 15-minute interval during the peak period. You can get a decent view of the Statue of Liberty. However, don't expect to come close to it. You could also get a pretty good view of Manhattan. The trip takes about 25 minutes. Do expect a big crowd of visitors. Most visitors just take the ferry there and back immediately. There's nothing much to do in Staten Island. To view Statue of Liberty, stand on the Starboard (right hand side) when going to Staten Island, and the port side (left side) when coming back to Manhattan. To get to Staten Island Ferry, take Subway Line 1 to South Ferry and walk to Whitehall Terminal. A better way of visiting Lady Statue is by Statue Cruises. 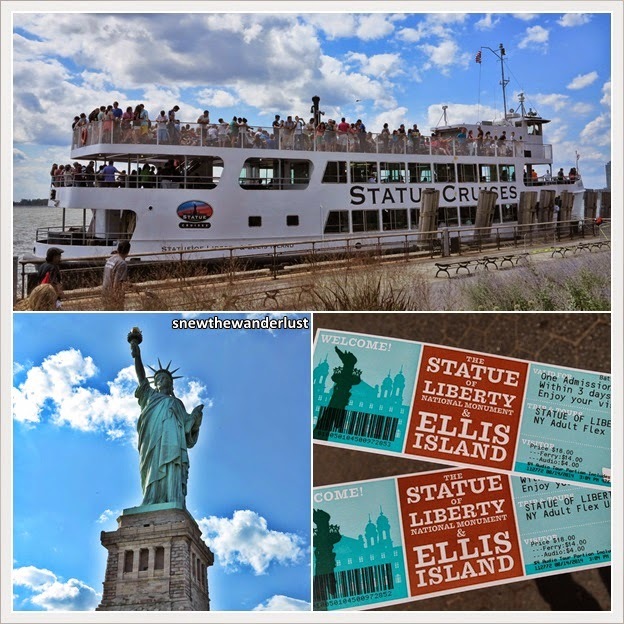 Statue Cruises is the official tickets and tours provider to Statue of Liberty (Liberty Island) and Ellis Island. You get access to the grounds in Liberty Island and Ellis Island. However, do expect that the queue line to be long as the security checks are similar to that of the airport. For US$18/Adult & US$14/Child, this is a much better experience compared to the Staten Island cruise. We got to the Liberty Island and manage to stand take a "close up" shot with Lady Liberty. However, as the queue line on the cruise was long, we were not able to get to Elis Island. Plan to get on the cruise by 2pm. There was a long line to get the tickets, and also to get into the cruise. If you arrive after 3pm like we do, we will only be able to choose either to get to Liberty Island or Ellis Island. No one would ever say they have been to NYC if they have not been to Times Square. The huge lighted billboards, overcrowded streets, is the iconic venue for every New Year's Eve Countdown. No city has been able to emulate the vibrancy of Times Square New York. It's bright, colourful, crowded, full of buzz. 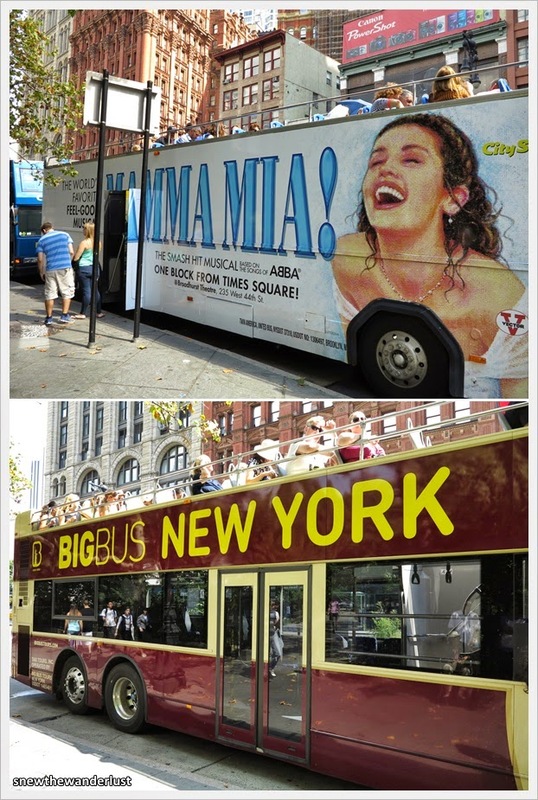 We stayed around Time Square area, and while it cost us a bomb, the location was without any doubt, the best. The streets are filled with people even at midnight. But of course, it's summer. One of the "must do" at Time Square is to sit at the platforms above the TKTS booth. You see this area in a lot of movies, such as the Spiderman movie and yes, it is what it looks in the movies. 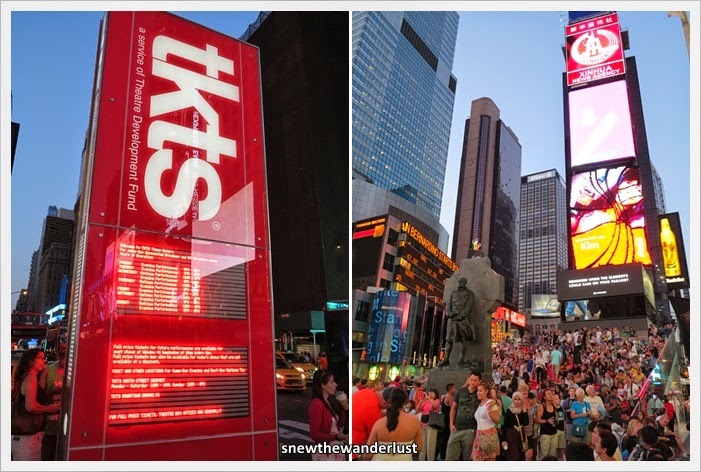 TKTS is one of the ways to buy discounted broadway theatre tickets. These are the last minute deals. You will only be able to buy the tickets for that day performance. Depending on the popularity of the shows, discounts can be up to 50%. The other must visit is the 3-storey M&M boutique. M&M fans will go gaga over here. You will, of course, not be able to miss the street performers, mascots around the area. Naked street performers, including the famous "naked cowboy" are amongst the popular ones. Don't forget, if you take a photo with them, it's not free. They expect between US$5-10 of tips and they are not shy to demand it from you. If you are deciding between the both, why not, just do both. Afterall, how often do you visit NYC if you are from Asia. 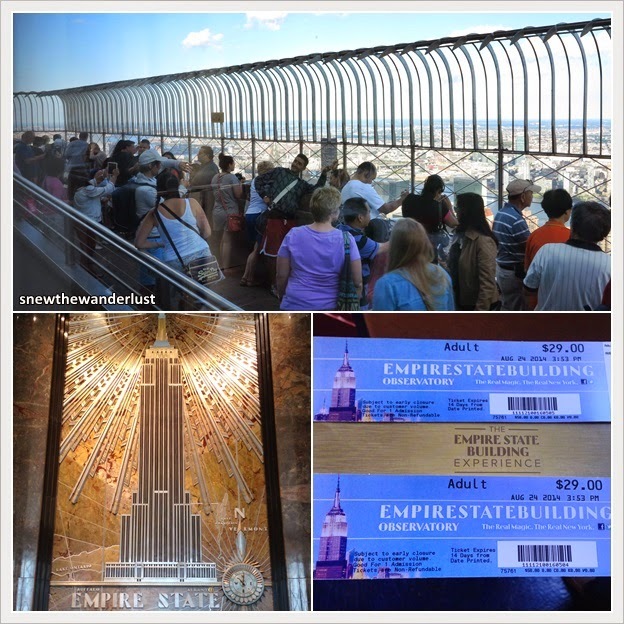 Empire State Building is the ever-popular venue to get a fabulous view of New York City. The view at this place, is no doubt, breath-taking. However, the access to the views are blocked by safety grills. Top of the Rock Observation Deck is located on the top floor of the Rockefeller Center. I personally prefer this as the views were unblocked by grills or barriers. We could also take our selfie stick and pose for numerous photos. [Selfie sticks were not allowed up Empire State Building and we have to leave it at the security checkpoints]. We spent a lot more time here enjoying the views. There was free wifi and while we enjoy taking the beautiful views, we were able shared it simultaneously over social media. There are a number of companies running it. Most of them run similar routes. We choose Grey Line as it's probably the most popular one with live commentary. The open top buses runs on similar route and has numerous stops that allows you to hop-on and hop-off at different stops. This is a good way to tour Manhattan for first timers like ourselves. There were unlimited day passes for us to choose. We also got to take photos of sights that was otherwise difficult to get a good view. If you are there during the summer, remember to put on sunblock, as we both got a tan from the sun. 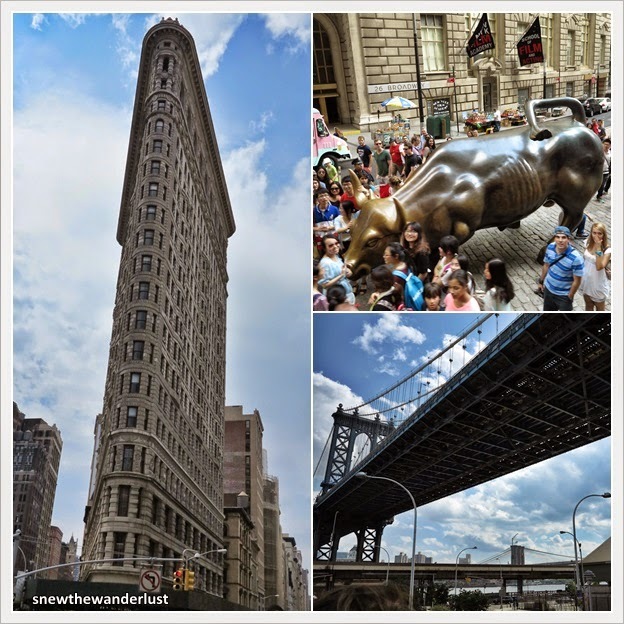 The flatiron building, Wall Street Bull, Williamsburg & Manhattan Bridge together. During Summer, the tour companies also operate night tours. I particularly enjoyed the night tour very much. It was a breezy ride with spectacular view of Manhattan from across Brooklyn. We were amazed to find amidst the tall skyscrappers, is a 850 hectares of lush greenery. 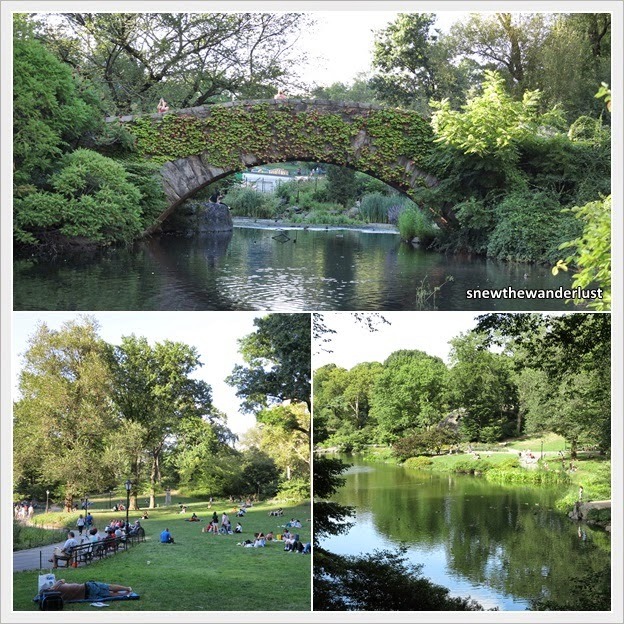 Central Park, although it is a man-made park, but it's so beautifully designed. One can rent a bicycle to go round the park. We had a 2-hour bicycle coupon but just couldn't squeeze any time slot to do it. There's even a Zoo in the park. The other park, which I personally prefer, is Byrant Park. It is next to the New York Public Library. 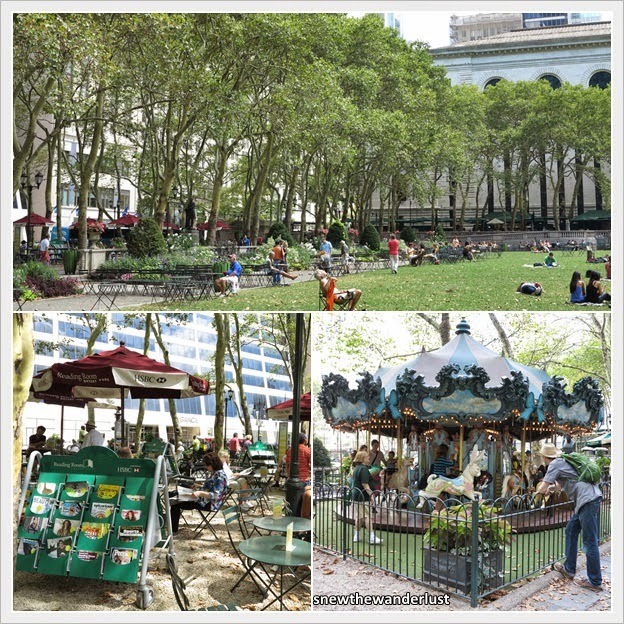 Located just next to the New York library, there are so many activities surrounding this park. Magazines are available for one to read. Wifi is available at Bryant Park and power point socket to charge your laptop when your battery runs low. Board games, Ping Pong and other games were available in the park. It's interesting to see families get together to play Pétanque, a french ball game. Well, Papa Snew and I are not museum people. So we skipped that. However, for those who watch 'Night at the Museum', a visit to American Museum of Natural History would be a good choice. For me, New York Public Library is the one on my list. Just a petty that I didn't get the chance to enter the library. Grand Central Terminal is probably one of the most historical landmark in NYC, and probably the most busy train station in the country. I am amazed how this historical building with a well-kept facade has a modern interior design. 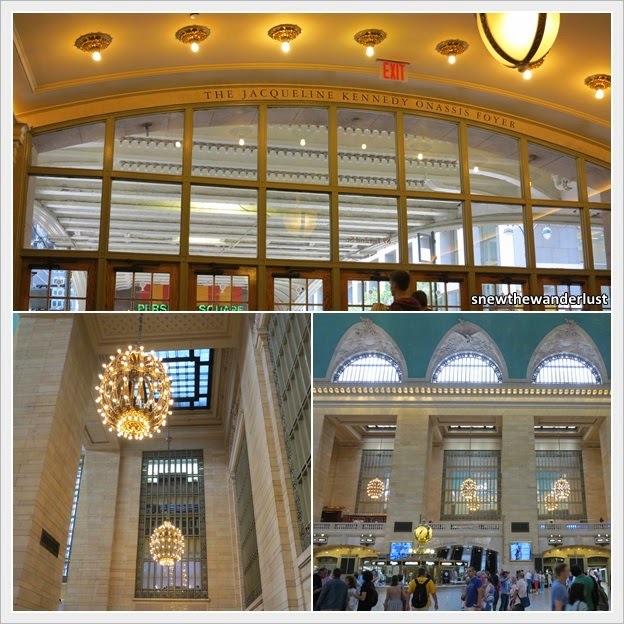 This is truly one of the most beautiful train terminal that I've come across. The Meatpacking district used to be a meat-packing warehouses. It used to be what its name entails - a district where meat are produced and packed. It has now developed into a fashionable neighbourhood with hip restaurants, clubs and high exquisite boutiques. 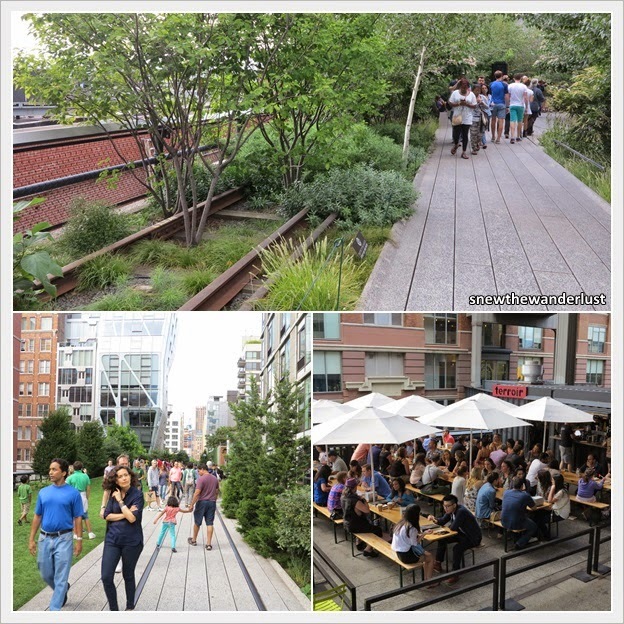 One of the highlight is the 2.4km long disused railway, transformed into a public park. 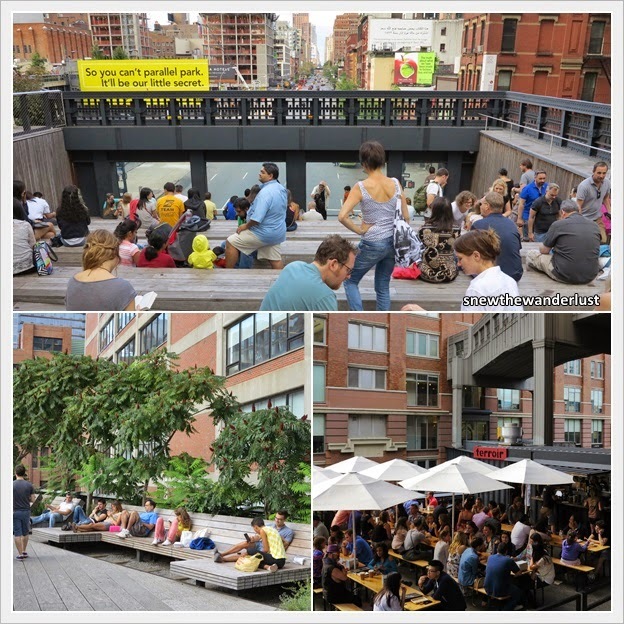 This elevated park is one of its kind, located in between buildings, streets and neighbourhood. A good meeting venue for the locals to relax while catching a quick lunch. 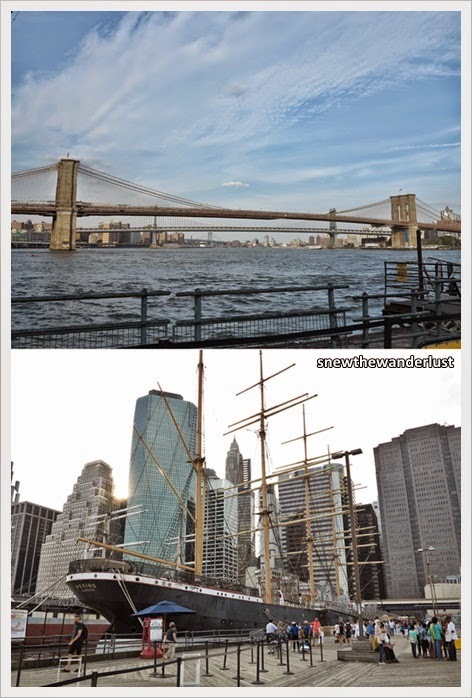 South Street Seaport is probably one of the overlooked places in NYC. 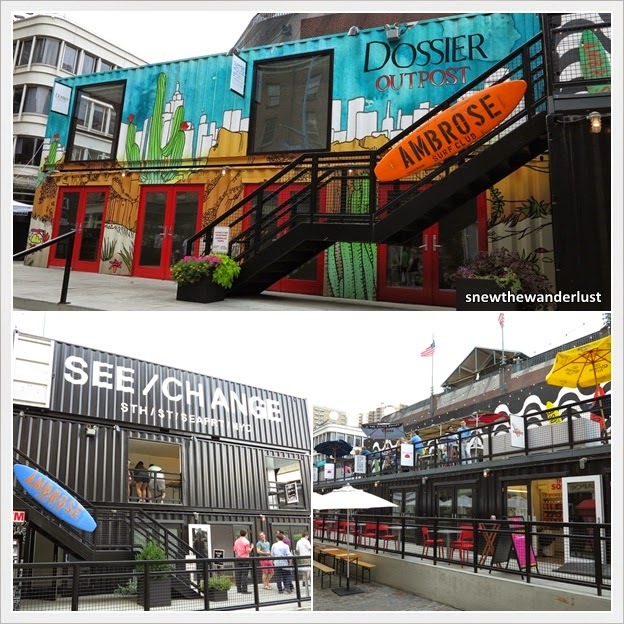 Located at the financial district, South Street Seaport is a historic district, adjacent to the waterfront. In 2012, the seaport was badly damaged by Hurricane Sandy. Restoration works has rebuilt the place to a hidden gem. During weekend nights, outdoor movies are shown. You can bring some snacks, get some takeaways from food trucks, coupled with some beer and chill the evening with your peers. We love the Abercrombie & Fitch retail outlet here and did some shopping at this outlet. Alright, I better stop at the current "must visit" list. I'll continue on part 2 on some of the other places that are worth a visit. Stay tuned!